Vitamin A 55%, Vitamin C 62%, Calcium 6%, Iron 24%. 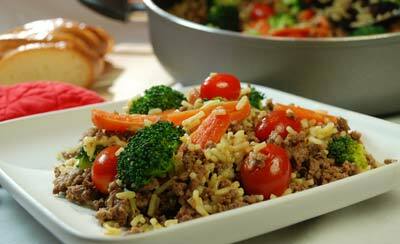 Prepared using lean ground beef, unsalted butter and Knorr Rice Sides Cheddar Broccoli. Cook beef in large skillet, stirring occasionally, until browned; drain. Stir in water, carrots, butter, pepper and contents of rice package; heat to boiling. Reduce heat. Cover and cook about 15 minutes or until carrots are tender. Stir in broccoli and tomatoes; cook, uncovered, for 5 to 6 minutes or until heated through.